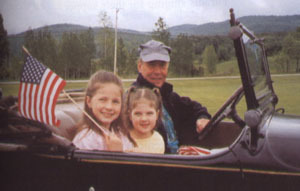 Gael shown here with grand-daughters Leah and Abigail, in his 1929 Chevrolet in a Memorial Day parade May 28, 2001. Gael is an early member of the club, being the youngest club member at the time he joined back in 1954. Gael was vice president of the club in 1960 and 1989. He alternated with Cena Galbraith briefly as Wheel Tracks editor, was a contributor to the 30th Anniversary Wheel Tracks and a member of the committees for the 40th and 50th Books. In recent years Gael has enthusiastically hosted many successful monthly meets, especially garage tours and has been a judge at the Shelburne and Stowe shows. Many regard Gael as the quintessential auto enthusiast because of his motivation, vision and dedication to the VAE and the old car hobby. He owns a collection of trucks, farm tractors, and old cars – the most notable being a 1917 Locomobile. He and his wife Judy live in Underhill.